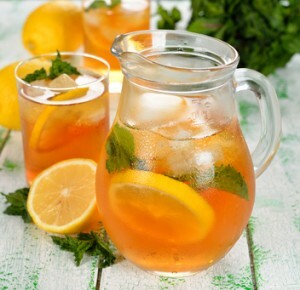 Iced tea is one of those delicious flavors that just makes the summer time seem worth while. It has all of the caffeine of soda pop, but with none of the artificial bubbly junk that feeds nameless corporations and their ilk. Iced Tea is natural, honest, and infinitely cheap. If your tastes run towards the exotic, and away from caffeine, then try your favorite herbal tea on ice. Brisk and refreshing, it will open up new avenues of beverage exploration. Get out a 2-quart size sauce pan. Put the hot water in it and bring it to a boil. Add the tea bags. Remove the pan from the heat, and allow it to steep for 10 minutes. No more, no less. Set the timer. If the tea sits for too long, it will extract bitter elements from the tea leaves, making the finished product taste horrible. If it doesn’t sit long enough, it won’t be strong enough to give you the caffeine jolt which iced tea was designed for. When the time is up, remove the tea bags and blithesomely toss them into the garbage, they have served their purpose. Put the cold water into a 2-quart size pitcher. Pour the hot tea into the pitcher, over top of the cold water. You put the cold water in first, because the hot tea could melt the pitcher, seeing as it is so hot. The cold water acts as a buffer, and cools the tea. Add the sugar or honey if you like, stirring to dissolve it completely. Put the pitcher into the fridge to cool. Or it can be poured directly into an ice filled cup. I like iced tea strong, so I use 8 tea bags. I buy the boxes of 100 tagless tea bags, usually a store brand, for about $1 a box. This makes 2 quarts of tea at a cost of 8¢! I don’t add sugar to mine, preferring it unsweetened. But that is a personal choice, and lots of folks like it with added sugar. The nicest thing about this recipe is that it makes perfect iced tea every single time. If you liked this recipe, take a look at my ginger tea mix. It’s another frugal drink recipe from my extensive collection. The Dining On A Dime Cookbook is packed with over 1,200 money saving recipes and tips, kids tips and snack ideas, gift baskets, menus, food storage directions, Cleaning Cents and Pretty for Pennies. The recipes are easy to cook with ingredients that you probably already have in your pantry. To make shopping easy and economical, it also includes a pantry list and a shopping list.